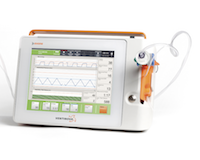 Ventinova’s mechanical ventilator Evone is unique in controlling the inspiration as well as the expiration during artificial ventilation of a patient. Tritube is an ultra-thin ventilation tube for adult patients. It provides easy access to the airway, a secured airway and a spacious surgical site. Ventrain not only supplies oxygen during the inspiration phase, but also actively removes gas from the lungs with Expiratory Ventilation Assistance (EVA). Cricath is a flexible 2 mm needle catheter for quick and easy cricothyrotomy. A number of smart features results in easier handling and reduced risk of kinking. Ventinova’s mechanical ventilator Evone is unique in controlling the inspiration as well as the expiration during the artificial ventilation of a patient. Ventrain not only supplies oxygen during the inspiration phase, but also actively removes gas from the lungs with Expiratory Ventilation Assistance. Cricath is a flexible 2 mm needle catheter for quick and easy cricothyrotomy. A number of smart features result in easier handling and reduced risk of kinking.